Beautiful apartment, elegantly decorated, set in the heart of the ancient Jewish getto of Rome, walking distance from Major city sites such as 2 mn from Campo dè fiori , 2 mn from Trastevere, 5 mn from Piazza Navona , near transports that will allow you to reach the other parts of the city, near shops and restaurants. With table and chairs, with double sofa, cable TV, dvd player table and chairs. Independent heating, AC only in the bedroom, cable TV, dvd player, washing machine, microwave, internet WiFi, double glazed windows, no elevator ( 40 steps). Prestigious two bedroom flat with balcony, located on the second floor of a period building without elevator in Piazza Margana, a pedestrian square quiet and peaceful, at a few steps from the Campidoglio and Capitolini Museums, Piazza Venezia, the Jewish Ghetto, Campo dei Fiori, Piazza Navona, Largo Argentina. Entering the luxury apartment, fitted with cotto floorings, a lovely foyer with a small couch open up onto a spacious living room overlooking the square, furnished with antique furniture, design pieces and original paintings. The room offers a relax area with confortable couches, a coffee tabe and some poufs, a dining area with a table for 4/6 people and a study corner with a writing desk. The separate kitchen is quite small but fully equipped and complete with a dishwasher, gas stove, fridge, freezer, toaster, Nespresso coffee machine, microwave oven, pots and pottery. It should be noted that air conditioning is available in the bedrooms only. A corridor leads from the foyer to the night area, wich includes a master bedroom with a King Size bed, a balcony overlooking lovely gardens and fitted with hair conditioning, together with a second bedroom with a small double sofa bed (mattress 120x190 - 48" x 75"), air conditioning and a small table. The first bathroom with bathtub and the second one with a shower complete the apartment. The apartment is located in one of the most characteristic areas of Rome historical center and its strategic position permits to reach in few minutes the most importants points of interest of the city. In Piazza Venezia there is a taxi station and various bus stops leading to the most important areas of Rome. ’m back in the States now and just wanted to let you know that everything went smoothly with both my apartment rentals in Rome (Pincio in Spagna, with contact Barbara Lessona, and the Margana apt., with contact Ilaria Palmeri). Both contacts were responsive and friendly, the locations were great, and the Internet worked well in both. 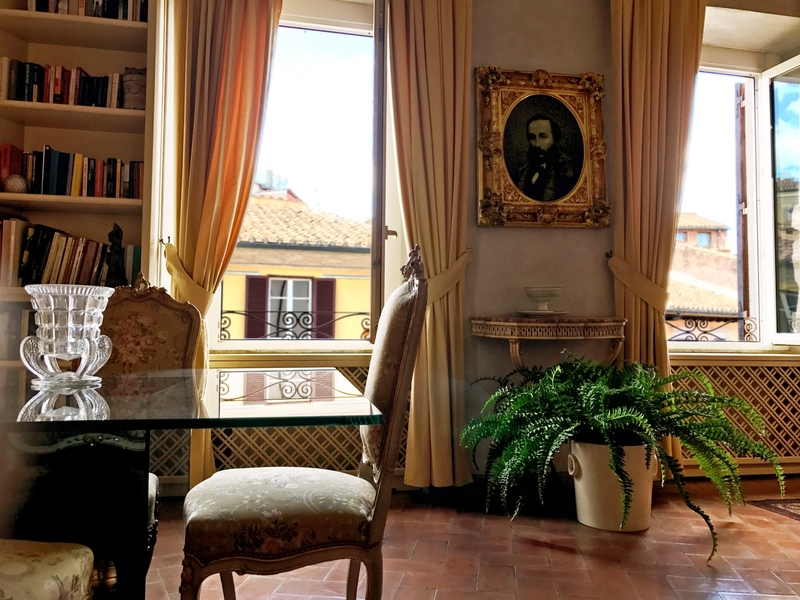 The Margana apartment in particular, with the feel of an aristocratic palazzo, was very special – the owner left out all her fine china, and with the paintings and furnishings, it felt like a real home – an elegant one.